This point of land on the Dominican Republic’s southern peninsula is home to the bright white beaches and clear waters. Alone, these two elements draw visitors to the region from around the world. It is among the first areas where European explorers settled by. So there’s also a wealth of history to explore along with enjoying the native culture of the island. These four- and five-star Punta Cana luxury resorts offer visitors a chance to unwind and appreciate all of the beauty of this tropical haven. The cheerful yellow and white facades of each villa at this resort underscore its breezy and relaxing vibe. Each accommodation features exemplary design, spacious living spaces, kitchenettes and beachfront views. You can dive in soaking up the sun as your top priority. Other activities include golf, a full range of water sports, tennis, spa treatments, and complimentary use of bicycles. After a full day’s worth of activities, enjoy dining at either the pool view or over-water restaurants. Treating its guests like rock stars, this popular resort features in-room spa tubs, dual showers, balconies and a unique liquor dispenser. Live entertainment each night keeps guests amused. After a day full of activities, the spa provides welcome relaxation and renewal. The casino features table games, poker, and video slots for the gambler-type of a guest. There are numerous dining options, from cafes to formal sit-down meals to bars, numbering nine in all. Befriending the superb accommodations, the main feat of this hotel is the impeccable service. It allows guests to leave their cares behind and just relax, making the most of their stay. A fine example of Punta Cana luxury resorts that are adults-only, this sprawling complex enjoys easy beach access and sleek and refined guest rooms. Seven restaurants highlight a range of world cuisines and the live entertainment each night keeps guests enthralled. The Turkish-themed spa offers wellness treatments for couples that include massages right on the beach. A beautiful lagoon-shaped pool forms the centerpiece of this luxurious cliffside resort, the façade resembling a charming Spanish village of yesteryear. It has access to a private stretch of white sand beach and a nearby golf course. And there are plenty for guests to do: play ping-pong, Bocce ball, darts, bingo. Learn Spanish, taste wine, or take cooking lessons. There are live music and karaoke nights, movie nights as well as bonfire beach parties. Learn Spanish, taste wine, or take cooking lessons. There are live music and karaoke nights, movie nights as well as beach parties with bonfire.There are weekly staff vs guests volleyball tournaments and a weekly manager’s cocktail party. Delicious meals at one of four restaurants in a range of cuisines, a swim-up bar, and spa treatments keep guests feeling pampered. You can have the fun of swim-out suites and either ocean or marina views for any class of room at the AlSol Tiara luxury resort. In addition, this welcoming resort provides its guests with all the necessary ingredients for the perfect beachside vacation. There are cooking and Spanish lessons to hone your skills. And parties on the beach, a swim-up bar, movie nights or live musical performances to provide guests entertainment. Unique among Punta Cana luxury resorts, Casa de Campo is surrounded by lush jungle and 15 minutes of walk from the beach. This beautifully designed resort offers personal golf carts with each of its villas for ease of exploring the area. Choose from golf, horseback riding, shooting, water sports or tennis to fill the days with excitement, then enjoy a meal in one of seven restaurants before ending the day with a live show. This resort is a favorite among visitors to the Dominican Republic for many reasons. Some of them include the sea views, gourmet food, and impeccably furnished rooms. Noteworthy are the guided yoga sessions or the complimentary horseback riding, and massages. The exacting attention to detail includes maid service three times a day, complimentary minibar items restocked twice daily. And, for those looking to acquire new talents, classes that include lessons in cigar-rolling, cocktail mixing, kitesurfing, and painting. 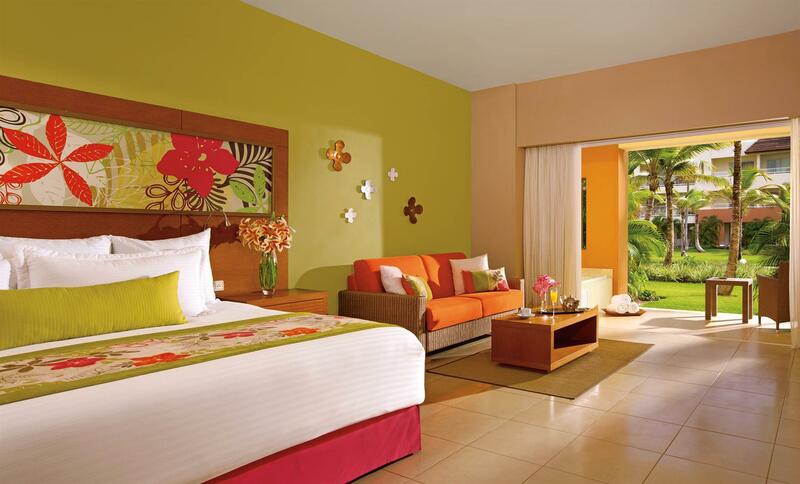 This is one of the most charming Punta Cana luxury resorts. The Excellence luxury resort incorporates palapa-style roofs, stone buildings and indoor-outdoor living into its aesthetic design. Suites feature light, airy rooms with sumptuous touches. Many activities keep guests filled with anticipation for each new day. These activities include golfing, sprawling on the beach, exciting excursions, gourmet dining, and spa treatments. Marble bathrooms, private balconies, minibars and turndown service are just some of the amenities to enjoy in each beautiful suite of this beachside resort. Enjoy kayaking, tennis, snorkeling, bowling or swimming during the day. During the night, try your luck and talent at the casino. The evening’s activities may include enjoying a live fire-dancing show, watching movies on the beach or theme nights at the pool. With a tropical climate that provides balmy sunshine year-round, these Punta Cana luxury resorts make an irresistible getaway at any time of year. It doesn’t matter if you’re a tired traveler in search for the perfect place of relaxation, an activities-enthusiast, or a businessman on a mini vacation. You’ll find the best of comfort, activities and amenities and staff services that a luxurious resort can offer. Have you ever spent time in the Dominican Republic? If you’ve had a chance to stay at one of these Punta Cana luxury resorts, tell us about your stay in the comments below.